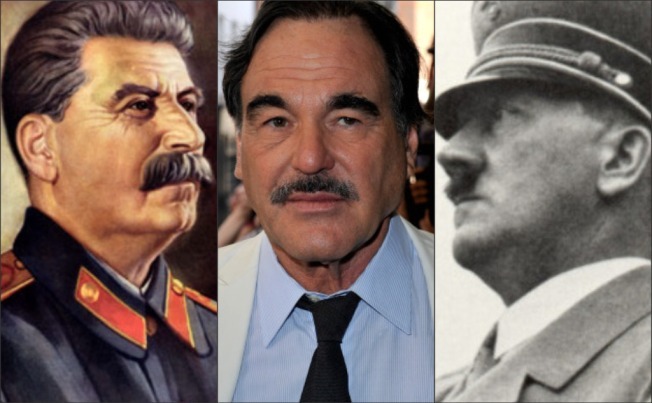 Crackpot movie director Oliver Stone is out to do for Hitler and Stalin what he's tried to do for Fidel Castro and Hugo Chavez. The three-time Oscar winner told a panel of TV critics Saturday that the 20th Centuries two most reviled dictators really weren't so bad after all. "Hitler is an easy scapegoat throughout history and it's been used cheaply," Stone said during a discussion about a 10-hour TV special he's putting together called "Oliver Stone's Secret History of America." Stone believes the American educational system has given kids a distorted view of history's heroes and villains. "We can't judge people as only 'bad' or 'good,'" Stone told the Television Critics Association. "[Hitler] is the product of a series of actions. It's cause and effect. People in America don't know the connection between WWI and WWII." Of Stalin, who historians believe may have been responsible for 20 million deaths, Stone said: "Stalin has a complete other story. Not to paint him as a hero, but to tell a more factual representation. He fought the German war machine more than any person." Stone has long cozied up to anti-American dictators, including Chavez. In his "South of the Border," Stone portrayed the Venezuelan strongman as a champion of the people. His 2003 documentary on Castro was seen as shockingly sympathetic to the Cuban dictator, and its release came amid a violent crackdown on dissidents on the island nation. "In trying to make a broader historical point about the range of atrocities the Germans committed against many people, I made a clumsy association about the Holocaust, for which I am sorry and I regret. Jews obviously do not control media or any other industry. The fact that the Holocaust is still a very important, vivid and current matter today is, in fact, a great credit to the very hard work of a broad coalition of people committed to the remembrance of this atrocity - and it was an atrocity."